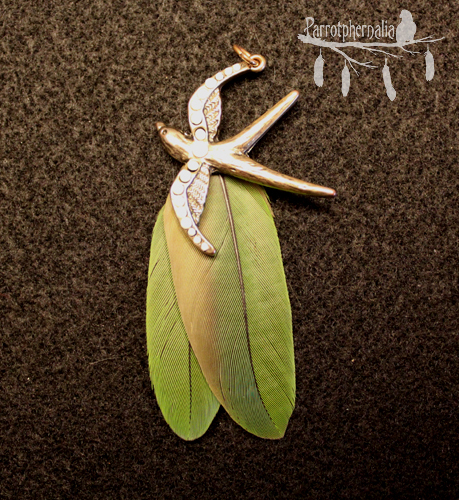 This small but sweet pendant is made from recycled Blue Fronted Amazon feathers and reclaimed jewelry. The horseshoe is gold coloured with white half pearl like gems added to one side. 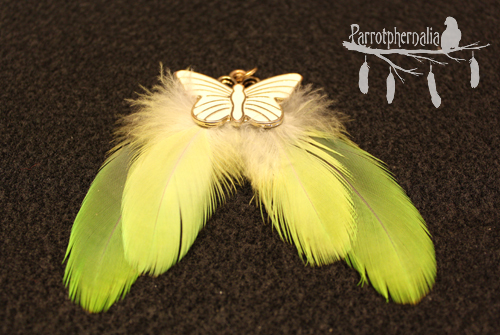 The feathers are a soft green and add a little more of that lucky colour to this already lucky pendant. It is 1.5 inches in length and just over 1 inch in width. If you are feeling lucky, then this is the piece for you! All feathers used in our products are recycled from happy, healthy birds. This beautiful and bright pendant is made from recycled Blue Fronted Amazon feathers and reclaimed jewelry. 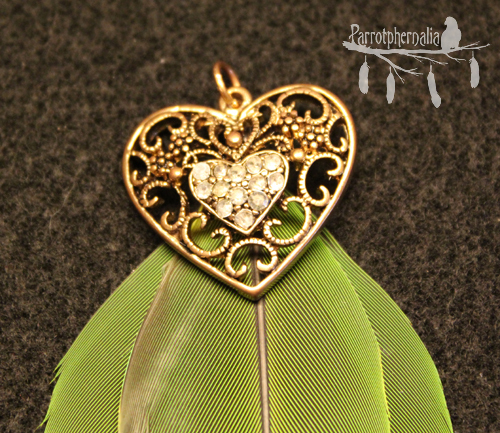 The heart pendant is gold coloured with sparkly gems in the center. 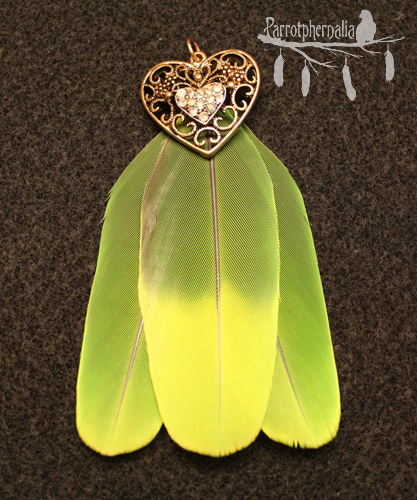 Behind the heart are vibrant, green and yellow recycled feathers. The pendant is just under 4 inches in length and just under 2.5 inches in width. No need to wear your heart on your sleeve any more! This beautiful and bright pendant is made from recycled Blue Fronted Amazon feathers and reclaimed jewelry. The butterfly is white with gold edges. The feathers are a vibrant, nearly neon green. 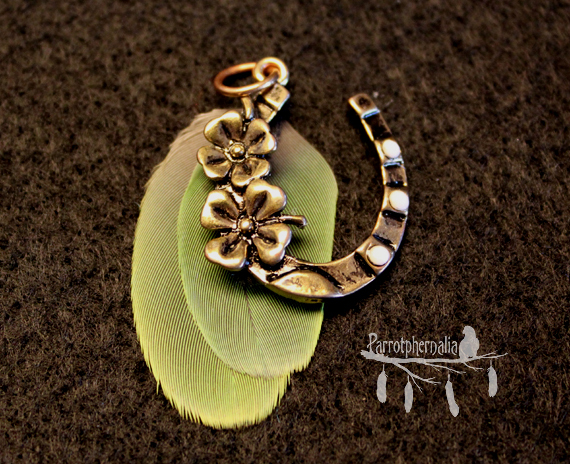 The pendant is just over 3 inches in width and just under 3 inches in length. 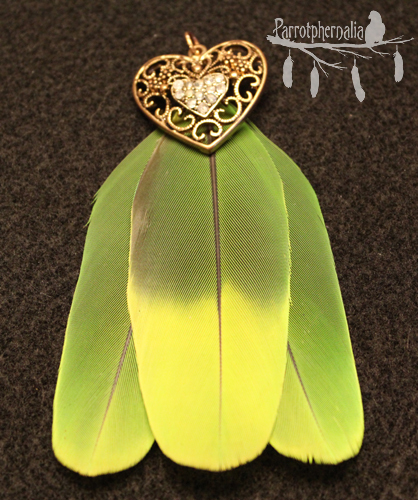 This stylish pendant is made from recycled Conure parrot feathers and reclaimed jewelry. 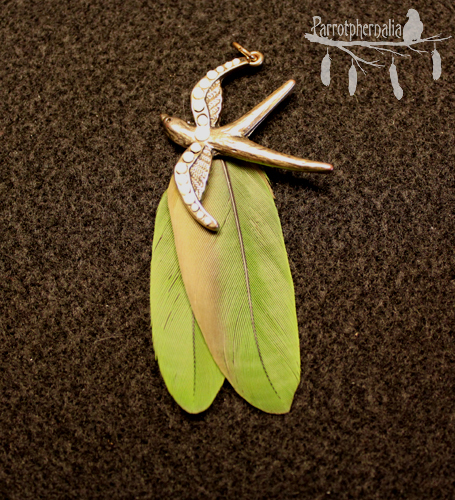 The swallow is a gold colour with white matte gems. 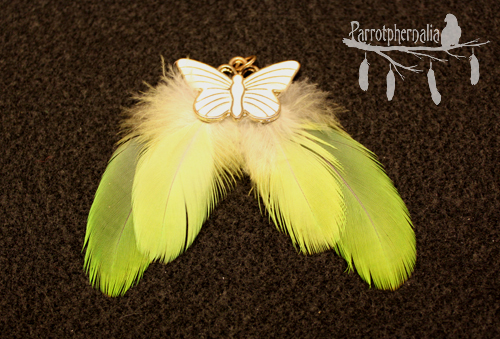 The lovely green feathers have a golden coloured edge to compliment the swallow. The pendant is 3 inches long. This would be a great gift to bird lovers!